The Heathkit DX-100B is a rugged CW / phone transmitter from the early 1960's. The one-piece formed cabinet features a convenient top-access hatch for changing crystals and making other adjustments. Featured are a built-in VFO, modulator, and power supply, complete shielding to minimize TVI, and a pi network output coupling to match impedances from 50 to 72 ohms. RF output is in excess of 100 watts on phone and 120 watts on CW. For operating convenience single-knob bandswitching and illuminated VFO dial on meter face are provided. Estimating the value of a rig can be challenging. 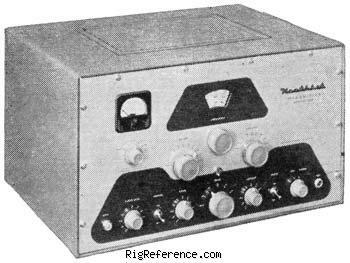 We collect prices paid by real hams over the years to help you estimate the current value of the Heathkit DX-100B. Just bought or sold this model? Let us know what you traded it for and help other ham operators!